Dear Government of India, please leave the coronary stents alone ! They are(not) our staple diet ! PCI and coronary stents are revolutionary concepts , still , they may not be great life saving devices . 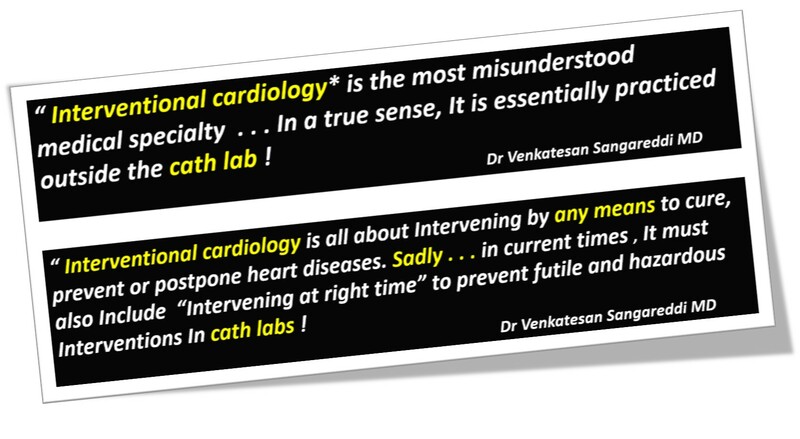 . . though the collective cardiology wisdom may seem to suggest so ! *While the true benefits for the patient population is unsure . . . it’s absolutely certain stents confer highest quality of life to the manufacturers and their chain of associates including the Noble professionals ! I wonder , what would be his comment about ubiquitous stents that rule the current era ! I sincerely believe the move by Government of India to control the stent price ( to enable all our countrymen to get it) . . . as if “stents are the only staple diet” for heart patients is ill-founded and dangerous . What the Government may not be aware of is . . .This 45000 crore omnipresent stent industry is playing havoc in the life of patients not only financially but also biologically to harm their blood vessels. Who will tell this to our policy makers ? Its a multi billion dollar Industry (Note : there is no pardon for Indian companies to exploit either !) trying to disseminate a commercially motivated concept intelligently including the stake holder Government in their loop. The move to liberalise stent usage is most unfortunate thing as the Govt has inadvertently increased the risk of abuse .Let the new age Indian not be proud about “Stent for all ” movement since the Govt will ultimately have to shell out for this imperfect therapeutics through public insurance . Though capping the price of the stent by Government do carry some sense . . . ultimately I feel its a trap . It’s akin to let loose a dubious modality in public domain within easy reach . Already the companies want to increase per capita metal consumption. That process will only get accelerated now.In a country where bulk of the ACS patients not even get prehospital Aspirin, we talk about primary PCI for all.It is a shocking medical economic hijack played in day light by a new generation thrombolytic called TNK -TPA is able to jack up the cost of coronary care with marginal benefits based on dubious off shore studies. I guess , very shortly the thrombolytic warrior Streptokinase is likely to be declared as endangered species and perilious for STEMI patients.If Govt really wants to tackle population based emergency cardiac care they should first upgrade country wide taluk or municipal level hospital with 24 h coronary care facility with trained doctors who can save more lives than the combined efforts of socially concerned corporate care takers. Some one should tell the Govt, cath labs would never come into the scheme of things for mangaing ACS in bulk of our country men.The Law makers and the corridors of power should be “forced to realise” there is an urgent & broader issue to be addressed.Its not only in cardiology but in all walks of health delivery system. How to prevent “contamination of medical science by pseudo cost effective scientific interventions fueled by corporate greed ? They should start sensitizing the young medical professionals in medical schools that will help the Noble profession remain Noble ! Its heartening to note Govt of India is Indeed taking some harsh steps to make drugs and devices affordable in a fair manner .The new authority National pharmaceutical pricing authority (http://nppaindia.nic.in/ ) has clear targets and are in hot pursuit towards righteousness in health care. Still, they have to be very watchful and work in tandem with medical council of India since commerce masquerades as science , price control alone is not a solution and there needs to be body regulating the true Indications as well . A crazy cardiology tweet and a wish ! I was recently asked to suggest a topic for debate on STEMI in a major Indian cardiology conference. I wished , this is what we should be mulling over, with a set of virtual guest lectures and special invitees from heaven ! Plenary session : State of the Art STEMI care Time : 11.AM , Speaker : Dr Hippocrates Topic : Aren’t we erring on either side of the Noble profession ? 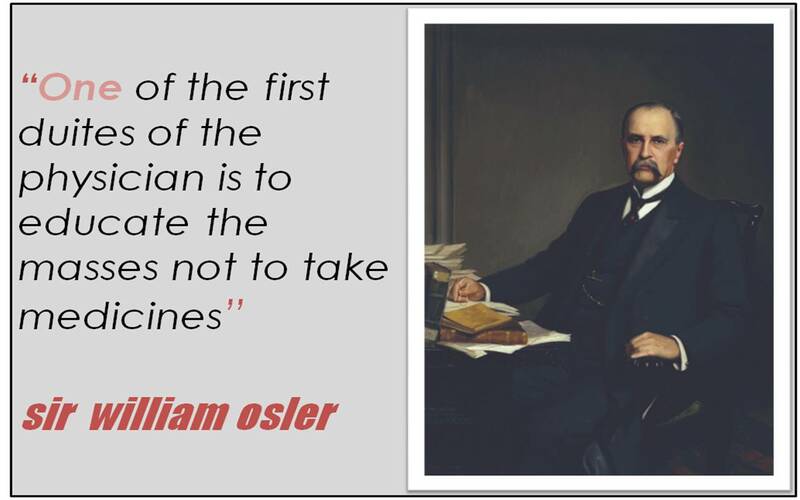 Moderator: Dr. William Osler Chairperson : Dr .Harvey Cushings, Dr,Sir Thomas Lewis ,Dr Paul Wood , Excerpts : “While , vast number of our country-men’s culprit artery doesn’t even get that mandatory Aspirin on time . . . an urban rich man’s distal non-culprit artery is decorated with a fancy bio-vascular scaffold making that innocuous lesion vulnerable in the process as well ! Aren’t we erring on either side in the Noble profession ? Learn the essence of Interventional coronary care in 180 seconds flat ! Your clock starts now ! Chronic stable angina : Most can be effectively managed by optimal /intensive medicines and life style Interventions .About 10% will require PCI/CABG. ACS – STEMI: Primarily managed with rapid and competent pre-hospital care with prompt thrombolysis in or out of hospital .Patients with large STEMI who develop complications (Again about 10 %) require PCI and few additional lives can be saved. ACS-NSTEMI : This is the group that demand an important role for PCI . All true high risk UA/NSTEMI patients should receive urgent coronary angiogram and critical lesions should either be stented or sent for CABG (If the lesions are multiple and complex ) The field of interventional cardiology is expected to play a major role in this category of patients for the simple reason , we not only give dramatic relief from angina and also prevent a potentially a huge MI that is waiting to happen ! The above suggestion is too simplified ,generalized , misleading , and unscientific, should strongly be disagreed. For those people who disagree , I provide an alternate scheme .It is ultra short ,comes in 5 lines .Very practical and scientific too ! In any patient , who is suspected to have either acute or chronic coronary syndromes ,take them to the cath lab in an urgent or semi urgent fashion .Do an angiogram and stent all lesions that you feel important . If stenting is not possible manage with optimal medicines and /or send them to the surgeons. The essence of catheter based coronary care is simple.We complicate it. To understand this concept 100’s of cardiology journals and as many conferences and infinite number of books are churned out every year ! When facts masquerade as myths . . . true scientists get confused ! Following are revered facts . . . among the “Guardians of Cardiology” ! 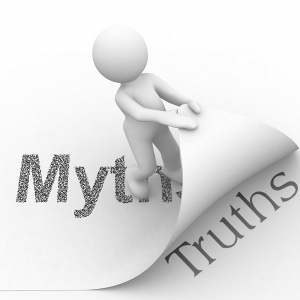 When false truths are synthesized to conceal a true myth . . . where will the poor myth complain ?Following are revered facts . . . among the “Guardians of Cardiology” ! Primary PCI is a greatest innovation in modern day cardiology .Without this modality most STEMI patients will buy Instant tickets to grave yard ! A cardiologist who intends to thrombolyse a STEMI is considered as a low quality cardiologist . Streptokinase should have no place in the crash carts of modern coronary care units. There is nothing called “Time window” for rescue angioplasty. VVI pacemaker will convert an electrical problem of heart block into a mechanical one by depressing LV function . Digoxin is an obsolete drug even in well established cardiac failure with dilated heart. Beta blockers not only fail to control blood pressure smoothly , it often converts a hypertensive individual into a unhealthy one by it’s prohibitive side effects ! Is it a crime to treat CAD without knowing coronary Anatomy ?? CAD is growing as an epidemic in most parts of the globe. It is a major determinant of health status of any country .Great strides in diagnostic, treatment modalities of CAD have been made in the last few decades. Still , the core principle of management of CAD resides in simple things like risk factor reduction / optimization , life style changes and few essential cardio-protective medications Aspirin, beta blockers and statins. However , modern scientists have made a firm statement that knowing the coronary anatomy before starting the treatment is the only scientific approach . It is a huge assumption ! Is it practical ? or is it really required ? CAD can be managed by means of medicines , interventions or surgery. Revascularisation is required only for those , who have critical , symptomatic lesions. It is estimated , in only a fraction of CAD patients , we would require to know the anatomy . We have set criteria to choose patients for CAG , who are likely to have critical lesions.Physicians are trained for that elusive wisdom to choose such patients .Standard text books do mention clear-cut Indications for doing CAGs. Unfortunately , it is least respected and followed . Cardiac physicians who would boast they can’t treat a CAD without knowing the coronary anatomy are clinically handicapped or poorly trained. I am afraid such a class of cardiologists are rapidly breeding in the country side. They are encouraged to attend CME on clinical cardiology and basic principles of clinical decision-making . The most important side effect of routine coronary angiogram is , it ends up in infinite number of inappropriate interventions ! I think , we should pray in Hippocratic temples for sufficient wisdom to choose our patients. We can also learn it from Neurologists , they somehow manage most forms of cerebrovascular diseases (scientifically too ! ) without asking for angiogram of circle of Willis ! Mind you. . . brain is equally a vital organ ! It needn’t be a crime to treat CAD* without knowing the coronary anatomy. Rather . . . it would be so , to ask for CAG indiscriminately , in every episode of chest pain , without applying clinical sense !